ASC operates two centers. Francis Beidler Forest in Four Holes Swamp is a 17,000-acre wildlife sanctuary featuring a 1-3/4 mile boardwalk through an old-growth cypress-tupelo swamp. Open Tues-Sun (closed Mon. & some holidays; admission fee). Silver Bluff along the Savannah River has 3,154 acres of upland pine forest, hardwood bottomlands, fields, lakes and streams with a checklist of over 200 species, including Wood Storks! Ed. programming and tours. Images © FBF, 2006-2016. Hurricane Matthew brought wind and rain to the southeast. Four Holes Swamp filled short of last October's record water levels, but rose over the deck of the boardwalk and overflowed swamp-crossing roads like US Hwy 78. However, the weather after the storm has been cooler, less humid, without precipitation and with winds generally out of the northeast. 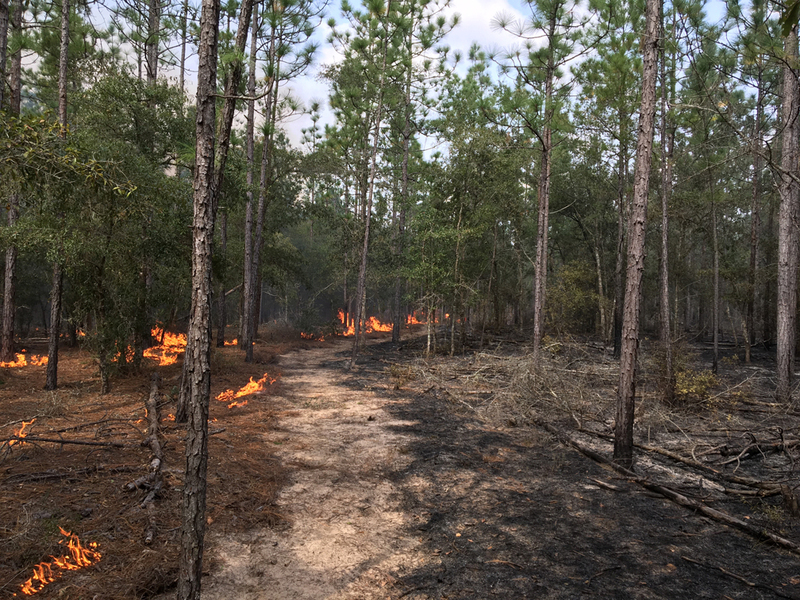 To conduct a prescribed fire at the GP longleaf pine tract, the first tract planted at the Francis Beidler Forest, wind direction is important. 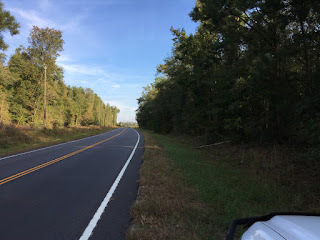 Due to the tract's location on the west side of Hwy 27, the winds must be from the northeast or east to prevent smoke from crossing the highway and presenting a danger to drivers. However, northeast winds are not the common wind direction for our area and are often preceded by or accompanied by precipitation. Spoiler alert: precipitation tends to put a damper on fires and fuels. 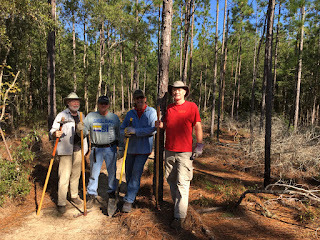 Therefore, after clearing the nature center's driveway of fallen trees and the fire break around the GP tract of several stout fallen oaks, we sent out a call for volunteers to help with the prescribed fire on Friday. 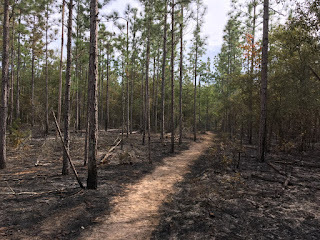 With the fire break disced, the middle fire break was cleared with a leaf blower in order to burn the 21-acre tract in two units. 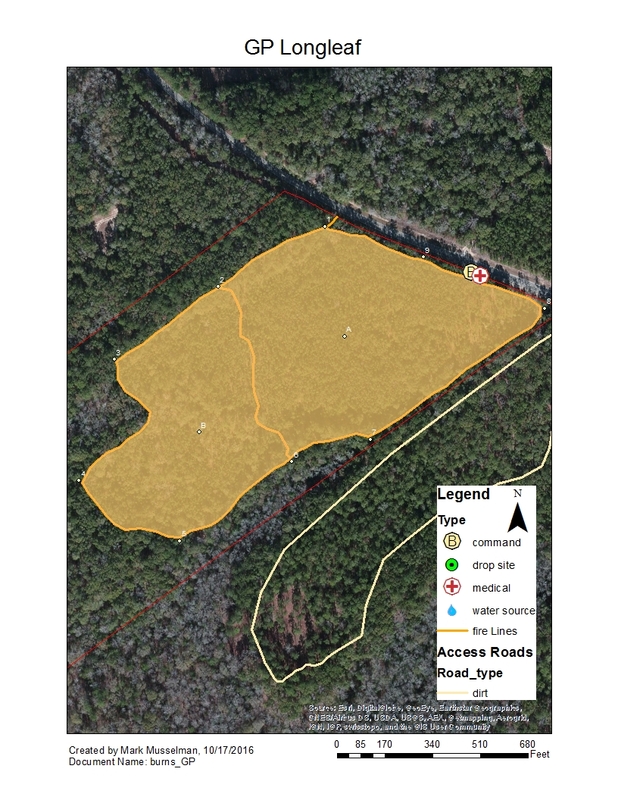 A test fire was started along the east side of the middle fire break in unit A in order to determine how the fuels would burn. Normally, a test fire is started in a corner in order to allow a rapid extinguishing of the fire should it behave contrary to expectations. However, water oaks have been allowed to infest this tract and are especially dense around the edges. The flat oak leaves do not burn well unless licked by a hot fire pushed by the wind, which allows the fuels to be preheated and dried. 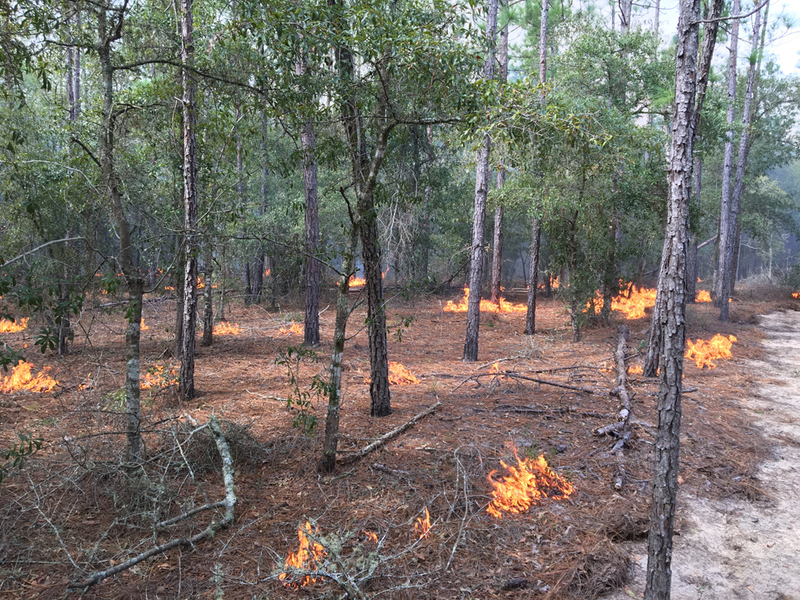 Additionally, the majority of fuels on the tract were pine straw and small woody materials, so a test fire in the oak leaves would not reflect conditions across most of the tract. Note the circular shape of the test fire as it slowly burns evenly in all directions in the absence of wind. 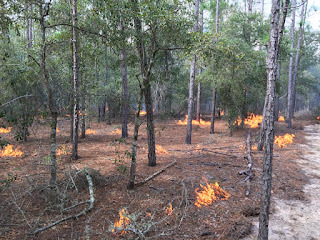 Being satisfied with the fire behavior at the test fire site, we used drip torches to light a line of along the line 2-6. We chose to burn unit A first as it is the closest to the highway and completing it before conditions changed was preferable. 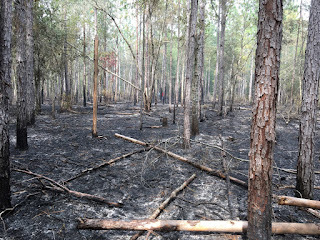 Additionally, unit A had been burned two years ago, while unit B had not been burned for 6.5 years, which meant that there would be more fuel on the ground in unit B and the possibility of a larger fire. With a swamp full of water to the west and a burned out unit A to the east, a larger fire in unit B would be easier to contain. 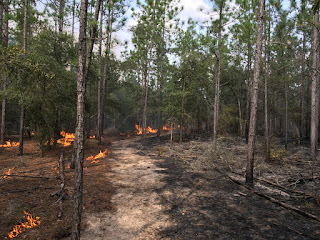 As the fire slowly backed into the wind from the eastnortheast within unit A, we began lighting spot strip fires at 20-meter intervals toward the highway. Below is an example from later in the day when we burned unit B. Dropping a continuous line of fire uses more diesel/gas fuel and creates a curtain of fire that generates more heat than is desired. By dropping spots of fuel from the drip torches every 10-15 meters, the spots burn out in all directions, like the test fire image, at a lower intensity. Eventually, the spots burn together and the fire briefly intensifies before consuming all the fuel and extinguishing itself. The result of the fire is a reduction of fuel on the ground, which will limit damage from a wildfire caused by lightning or human negligence. The next rain will help wash the nitrogen from the burnt fuels back into the soil. The bare mineral soil will provide the necessary conditions for longleaf pine seeds to germinate and survive. 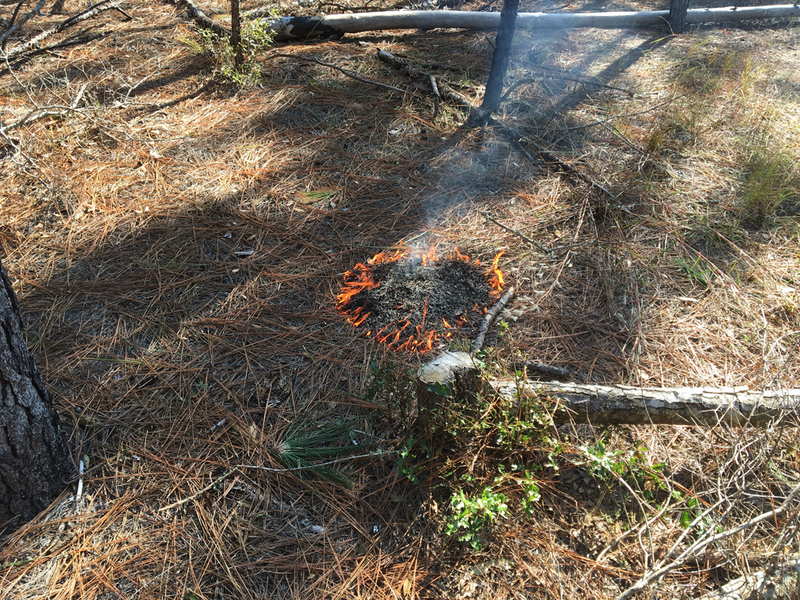 The seeds can germinate in the duff that existed prior to the fire, but survival is less likely as the duff layer can dry more quickly than the soil allowing the seedling to desiccate. 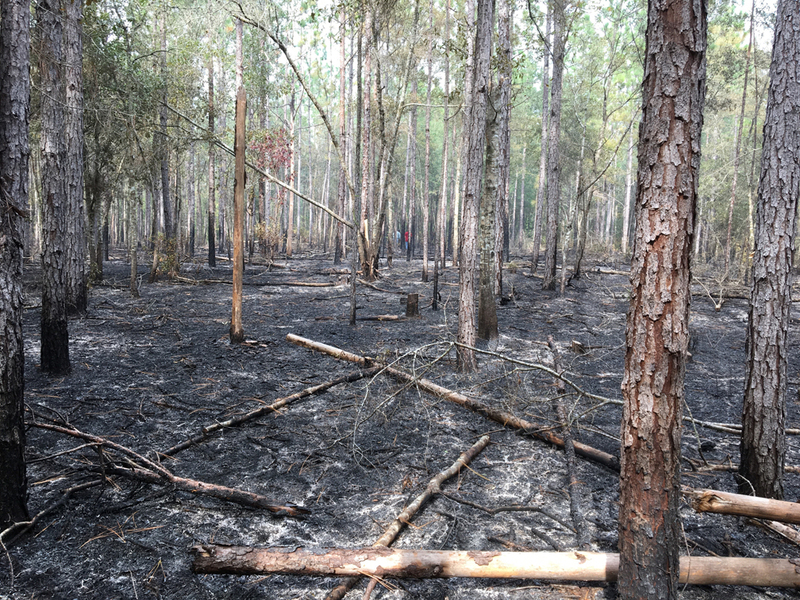 Competing loblolly pines and hardwoods are killed outright or top-killed as they are not adapted to fire like longleaf pines. Grasses and other forbs are invigorated by fire and immediately begin sending out softer material more palatable to deer and other wildlife. Not all desirable plants and animals survive, but on balance, fire is overwhelmingly beneficial to the longleaf pine ecosystem. At the end of the day, approximately 75% of the 21 acres burned and no smoke reached the highway. Success! Geolocators 2.0 - Time to Meet the Birds!